**Microbiology Pronunciations gives you accurate pronunciations of virtually all MEDICALLY important BACTERIA, FUNGI, PARASITES, and VIRUSES! 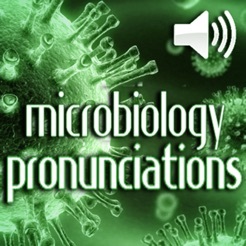 “Medical Microbiology Pronunciations” is a simple application that will play back audio of the correct pronunciations of virtually all of the medically important microbes. Anyone who has taken a microbiology course can tell you how challenging it can be to pronounce the names of those wacky bugs! Now you will have instant access to the proper pronunciations of all of the medically important bacteria, fungi, and parasites. 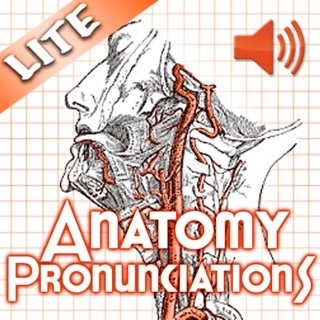 Stop butchering the names of these important organisms and download this application today! 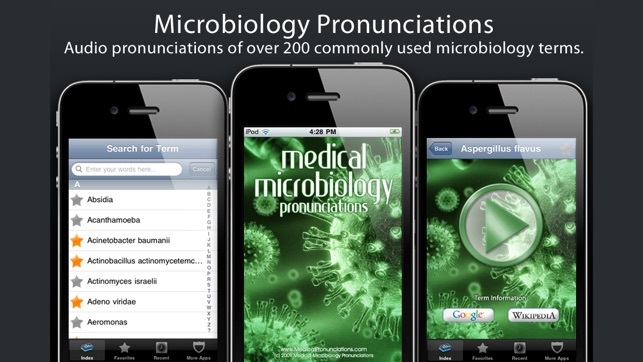 -Accurate pronunciations of virtually all clinically important bacteria, fungi, parasites, and viruses. -Internet access is NOT needed to listen to the pronunciations! -Continuous FREE updates for new microbes and user suggested terms. -Integrated web browser with direct links to wikipedia and google for additional information. 1. 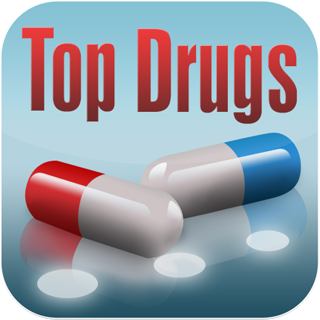 Browse the selection or enter the microbe of interest in the search field to narrow your list. 2. Select your term and press PLAY. It’s that simple! 3. To listen again press “Back” and select your term again. 4. For additional information about the selected term, press the “Google” or “Wikipedia” buttons to open an integrated browser. 5. 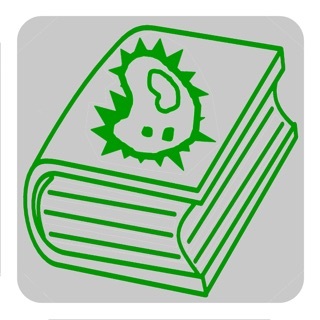 If your microbe is not listed, submit the word through the provided submission page and we promise to include it in future updates! We always strive to deliver the highest quality products and although we are very confident in the accuracy of our pronunciations, everyone makes mistakes! If you find a pronunciation that you disagree with, please let us know via email (contactus@medicalpronunciations.com) and we’ll be happy to look into it. Thank you! As a vet student, I was hoping this app can cover most of the common bacteria, it doesn't really cover like a third of them we discussed in class... Not recommended. 1. Change the icon. It's too complicated and busy. 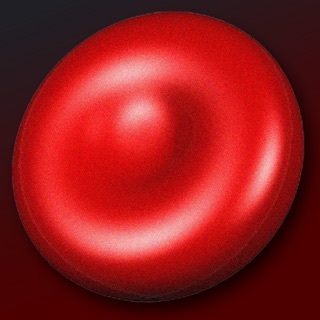 Very un-Apple-like. 2. Change the formatting for the word submission page. It is very difficult the read the word you want to submit for inclusion in a future update. I also noticed that you can't replay a pronunciation. You have to go back to the list and then re-click on the word to hear the pronunciation again. Finally, an App I can use that is work related! The pronounications are very clear and easy to understand. Would love to be able to press the play button as often as I want without having to go back and chose the word again. I've already sent in some names of organisms, would like to that screen be cleared up, because I had a hard time seeing the submission box. 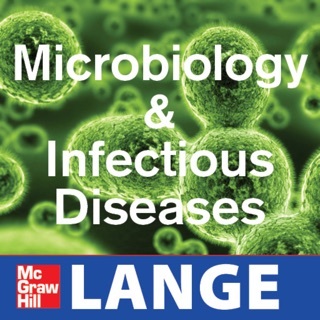 I would highly recommend this app to anyone in Microbiology.